EN GARDE! 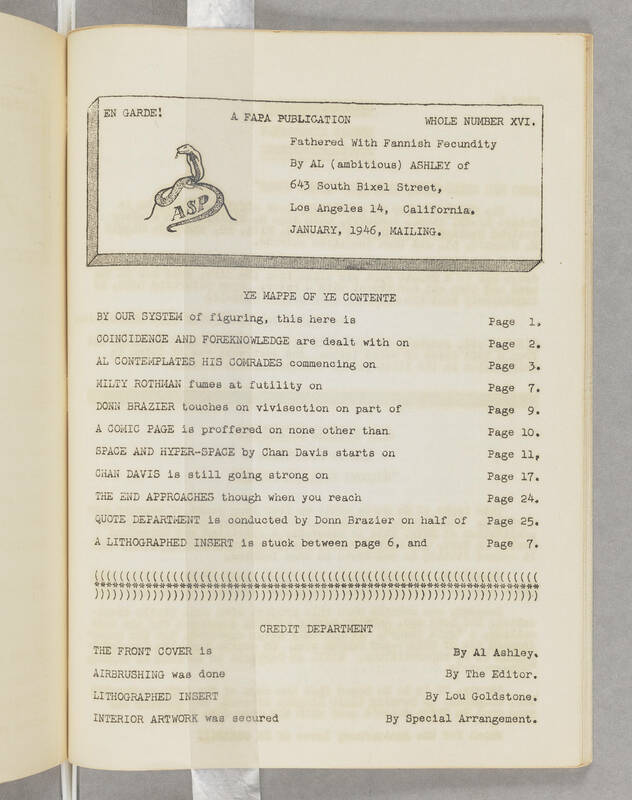 A FAPA PUBLICATION WHOLE NUMBER XVI. ASP Fathered with Fannish Fecundity By AL (ambitious) ASHLEY of 643 South Bixel Street, Los Angeles 14, California. JANUARY, 1946, MAILING. YE MAPPE OF YE CONTENTE BY OUR SYSTEM of figuring, this here is Page 1. COINCIDENCE AND FOREKNOWLEDGE are dealt with on Page 2. AL CONTEMPLATES HIS COMRADES commencing on Page 3. MILTY ROTHMAN fumes at futility on Page 7. DONN BRAZIER touches on vivisection on part of Page 9. A COMIC PAGE is proffered on none other than Page 10. SPACE AND HYPER-SPACE by Chan Davis starts on Page 11. CHAN DAVIS is still going strong on Page 17. THE END APPROACHES though when you reach Page 24 QUOTE DEPARTMENT is conducted by Donn Brazier on half of Page 25. A LITHOGRAPHED INSERT is stuck between page 6, and page 7 CREDIT DEPARTMENT THE FRONT COVER is By Al Ashley. AIRBRUSHING WAS DONE By The Editor LITHOGRAPH INSERT By Lou Goldstone. INTERIOR ARTWORK was secured By Special Arrangement.